This isn't Interstate 30, but it's still relevant. Just How Bad Is Dallas’ Rush Hour Traffic, Really? 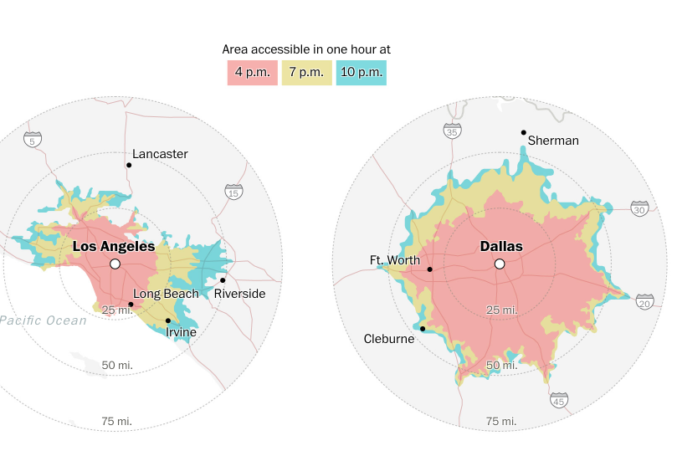 How far can you get out of Dallas in 60 minutes at 10 p.m. vs. at rush hour? This is not a math problem on a standardized test, we promise. It may not feel like it to anyone who has wasted precious late afternoon hours crawling on 75, foot hovering over the brake pedal, but a rush hour escape-by-car from downtown Dallas is positively speedy compared to the trip faced by commuters in most major American cities. This is according to a new analysis in The Washington Post, which relied on location measurements from smartphones and car sensors taken by Here Technologies. Using that data, Here measures changing traffic conditions and can map out just how far a determined driver can get from a given city center in a certain timespan. The Post looked at 30 cities, and measured the area accessible, in the span of an hour, to a driver heading out at three different departure times: 4 p.m., 7 p.m., and 10 p.m. In a dense city like Boston, for example, “you can drive a full 20 miles farther if you leave at 10 p.m. than if you leave at rush hour,” or the difference between Massachusetts and Rhode Island, according to this analysis. Getting more than 30 miles outside of New York in an hour is almost impossible at any given time. In Las Vegas, at the other end of the spectrum, you can get 50 miles into the desert whenever you want. Comparing traffic between cities is difficult, said Joe Cortright, president of Impresa Consulting, which specializes in metropolitan economies. If you focus only on the difference in travel time at rush hour, you miss the fact that in some cities, people just drive more, period. Sure, you can zip along at 60 miles per hour in St. Louis at any time of day, but you’re also much more likely to live farther from work, he said. And you can’t alleviate traffic by just building more roads. That’s the “fundamental law of road congestion,” which says that when a new highway is built, it just increases the amount that people drive. That’s not necessarily bad — it can mean people gain more access to jobs and other opportunities they wouldn’t otherwise be able to reach. So what is behind nightmarish traffic? According to Cortright, it’s about zoning and segregation. The model of the modern American city, with separate sections for living, working, shopping and eating, spurs congestion. 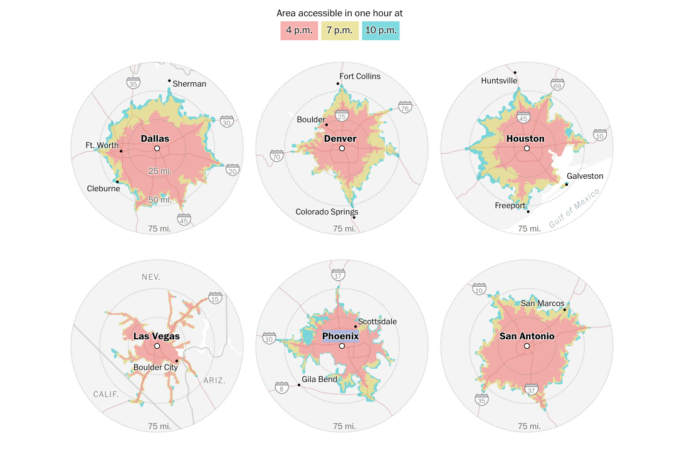 This analysis is not a judgment on smart transportation planning, but more a reflection of how a city’s “geography, economy, and history” affect commute times. In Dallas, there’s no Pacific Ocean or Rocky Mountains limiting sprawl or the construction of major thoroughfares, no environment we cannot pave. (Until recently, a toll road on the Trinity River seemed like a good idea to many people.) A car-centric culture nurtured by years of historical development catering to drivers — as opposed to East Coast cities designed before Henry Ford’s assembly lines started rolling — is partly to thank for our abundant highways. And North Texans are, traditionally, more likely to accept a long commute in the first place, largely because of geographical and economic features of the region: People will work where the jobs are, and live where the housing is affordable. We’re still spending two and a half days a year sitting in traffic in one of the most congested cities in the world — the most congested city in Texas. As the region’s population grows, so will that congestion, and our transportation challenges. The ability to stage a quick escape out of town doesn’t change that. But, right now, according to this analysis, if you’re looking to drive straight from work to start a summer road trip, there are few big cities better to leave than Dallas.